During bad times people seem to find themselves looking for silver linings. Trying to focus on the positive like a tangible, delicate edge of light which can be found in the most oppressively dark of situations. 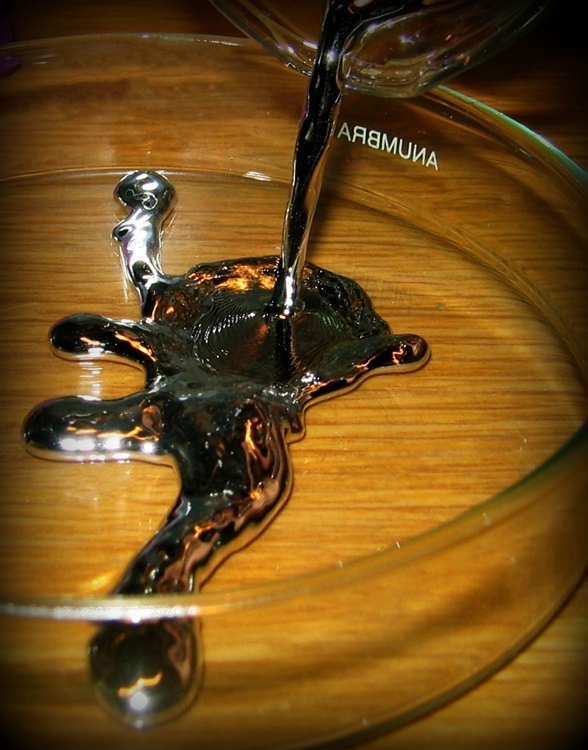 Ironically, the element of mercury is often referred to as quicksilver, which, although beautiful in its color and form, is a highly toxic poison. Both silver and mercury in liquid form can flow seamlessly, or separate, beading into individual droplets. They can also join or re-join flowing back into themselves. Times of crisis, trauma, and illness have uniquely intricate, tendril veins flowing through them of both types of silver, the hopeful and the toxic. Combining and weaving together, seamless despite their differences. Moments of hopefulness can be lined with foreboding senses of dread, while suffering can have superior moments of peace and graceful relief. During our struggles, the lining of silver and quicksilver can blur and become one. This silver mixture has moments which are uplifting and disheartening, sometimes simultaneously. Silver in all these complicated forms can be mesmerizing when flowing within you and it's not easy to separate yourself from the mix. Toxic has a way of lingering and linings have a way of evaporating too easily. As survivors, in our fight to endure, we can't just be on the lookout for silver linings, we need to create and nurture them. Be thankful for every delicate edge and work to expand them into the whole of us. Whether the lining is in the form of relief or support, fleeting or long-lasting, we have to hold them close and allow the hope in. As survivors, we have to battle to keep the toxic out and lessen its hold on who we are. When toxic silver cuts to the quick, we have to breathe brave and make from our wounds linings of a more forgiving, healing silver. To survive, it is important to create and cling to whatever silver linings when can and let the toxic quicksilver drain away.